It’s time for another red lipstick review. I’ve been putting off reviewing this lipstick for a long time, as although it’s a really popular one, I just don’t like it! However, I thought it was time that it got it’s place on the chart so we can see how I find it compares to the other lipsticks. As you can see I found it the worst of the “premium” brands I’ve reviewed. It’s lasting power might have scored a little better if it hadn’t been so dry that I ended up picking it off or putting on lip balm which made it slide within about an hour! Refreshingly little blurb for MAC lipsticks. It’s not going to change my life just make my lips a different colour. Despite the fact that I obviously didn’t like this lipstick it DOES have Pros! It’s a nice bright bluey red colour. Very vivid, and very matte for those who like a really matte lipstick. The packaging isn’t tremendously exciting, but it is sturdy and has been in the bottom of my handbag for nearly a year with nothing more than a few surface scuffs. The lipstick on my lips……. I just CANNOT wear this lipstick. I put it on in the morning, within 2 hours my lips are so dry that I can’t stop chewing them, then I put lip balm on and by lunch time it’s all gone apart from an irritating and unattractive line around the outside of my lips that I have to rub off and turn to one of my trusty top 3 lipsticks. It’s so dry that I find that it drags my lips when I apply from the tube and actually getting it to load a lipbrush if the weather is cold isn’t that easy either. I was incredibly disappointed as I’d heard a lot of people swear by this lipstick. I spent my own money on it and really wanted to love it, but I really don’t. Personally, I wouldn’t buy this lipstick again. I have heard that Russian Red is less drying, but my experience here makes me less inclined to shell out on another! If you’re a fan of very matte, dry lipsticks, or looking for a good shade for photoshoots, then maybe this is for you. This time I have gone for the beautiful background of the inside of our car for the full face photo. Shooting on location is so much fun….. I also look a bit starey eyed. Sorry! I agree with your review word by word! I feel exactly the same about this lipstick! Pretty colour, but I can’t wear it. I just had to try a few and found them surprisingly good quality for being a budget brand and some very pretty colours. I have a Revlon lipstick coming up for a review soon too! I wore this lipstick every day for a good few weeks but had to stop because it just trashed my lips too much. Such a shame, it’s a lovely colour. I’m just using up the last of my tube now so I can go buy a different one. I might go for Russian Red myself though, I was once talking to a MAC makeup artist and she couldn’t use Ruby Woo either and recommended I try Russian Red next time. Excellent review. I myself do not like MAC at all. Here in Australia it is a measily….$45 for a lipstick! I usually just pop on next door to Illamasqua! Speaking of which, have you tried them? I’d love to hear your thoughts. Illamasqua was the first lipstick I ever reviewed! It was bright pink, though, and well before I started the red lipstick series! See, I’ve spent hours trawling your blog and I managed to miss that! The next low-cost (but awesome) brand I would suggest would be Morgana Cryptoria, an indie goth brand, if you have ever heard of her? I have the Russian Red and find it does exactly the same as you described for Ruby Woo. I love the colour but HATE it on. If I do ever use it I find I have to slather on a lot of lip balm for the next few days until my lips get back in balance. One day I hope to try a Rockalily. EUGH!! I loathe this lipstick. I had the exact same reaction to it as you. Although – I did apply it with bit of balm – it STILL dragged on my lips, to the point of it actually hurting a little. The pigment *is* excellent – but not worth the trade off for lipstick that *does* need reapplying. Well – I found I could attempt to reapply – but it was a mess. The only way I could get it off was with baby oil – which would be grand – if it looked 100% all day. Alas. It was not to be. BUT. Do not give up on MAC totally. I can vouch for Russian Red as totally different to Ruby Woo. Slightly darker in colour – but still with matte bluenotes – it has the same consistancy of Beseme and lasts all day – for me at least. If I *do* need to reapply – it glides on. I do not find it drying at all. Why this formula is SO much better than RW – I don’t know. You can have any photo pirnted with a border. You need to go to a pro or semi pro shop to have them pirnted. Just tell them you want a border. Two ways to achieve texture: high speed film like Kodak 3200 which was created for taking photos at night is great to experiment with. The more light you use and or the larger you blow up the photo, the more grain and depth you get. On the flip side, a film like Agfa 25 or 50 will give almost no grain and can only be shot with a good light source. This will give you sharp details. Also, it is best to use a tripod with a slow speed. It’s basically impossible to stand completely still and that may reflect in your photo. This film for any 35mm camera. I would recommend purchasing a yellow filter for black and white, which will give you higher contrast. And again, any pro or semi pro lab can print photos in sepia. Something I quite enjoy is after my negatives are developed, I have some of the photos pirnted in color. The difference in going to a semi/pro lab is that they adjust each photo individually. When I have them pirnted in color, the black usually has a dark blue hue which gives greater depth. Ilford is also a beautiful film. I would stay away from Kodak black and which with the exception of the 3200 speed. Thanks for this review. Think I’m going to try the Rockalily one. Roll on payday!!! 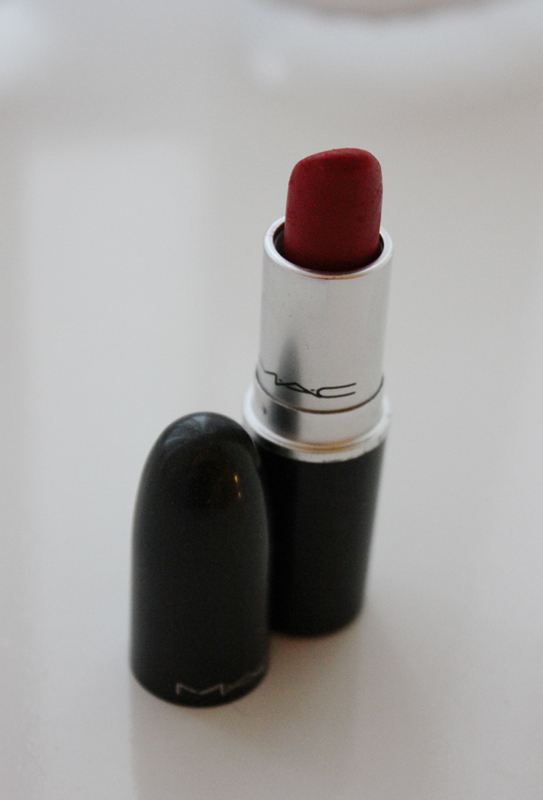 I hate this too – i wear MAC Russion red , still matte , amazing staying power and a fabulous colour ! Love the vibrancy of the color. Very fresh-looking! Believe it or not, this review is far more positive than any I would give this lipstick. I can’t even get it onto my lips! It just will not stick to them at all! It’s far too dry and although I do eventually manage a few red smears on my lips, it makes it all wrinkly and just horrid. Maybe I have naturally dry lips? I don’t know. I just hate it. I’m so glad I had the opportunity to try it and didn’t spend any money on it. I’m quite happy to stick with my Max Factor. My longest chum is a MAC trained beautician, and she uses these for shoots but not ‘real life’ day to day wear, which kind of sums it up! For the matte look I find Urban Decay have a nice texture – of the pricier ones – but a funny taste. But MAC is just TOO dry. You need to buy the primer too (which lasts *ages*). Then it glides on effortlessly and doesn’t dry your lips out. I find that no other red lipstick survives kissing. I hate not being able to give friends a peck on the cheek/lips die to lippy transfer and this one completely solved the problem for me. I’ve heard mention of the primer before, but it just seems like yet more money to lay out to me! I have a few other lipsticks, the Besame, Rockalily and No 7 Moisture Drench are the first 3 I think of, that as long as I blot, I have no transfer problems. Probably wouldn’t risk a full on snog though! I, too, can vouch for the primer! I love it and it makes ruby woo glide on without drying, plus it seems to make lipsticks last longer. With that, I’m a ruby woo fan as the colour seems to suit a lot of different people, it stays put, it’s very matte (which I like) and it is drink and kiss-proof. I have friends who have both ruby woo and Russian red – the latter is definitely a different texture (less matte, not drying, easier to apply), so that could be an option. Within MAC’s matte lipsticks there is a range of matte-ness, so it’s worth trying others. i agree, i love it when i first put it on, but i end up topping it up when i dont have to just because my lips are drey, or if i use lip balm it turns into a big gloup on my lips, horrible! Russian red is lovely as is lady bug. lady bug is one of my fav everyday lippys, as its kinda red but sheer. 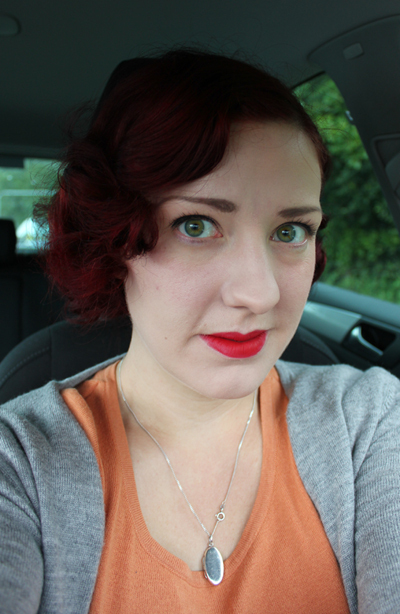 I’m so glad I went for Russian Red and not Ruby Woo! Such a shame it’s so drying as the colour is really nice. I’ve had no problems with Russian Red, it only feels a teeny bit dry when I put Lipcote over it, which tbf is really drying. my word it is refreshing to read a review that is not just sycophantic adoration of Lord Mac. Thanks for this, i could not agree more. Personally, (and i feel there should be AA style group therapy sessions for what i am about to declare), I don’t rate Mac at all. There, i said it. I have been disappointed in their lipsticks, eyeliner and mascara. The latter have not proven to be as poor as i’ve found the majority of lipstick that ive tried, but they just don’t live up to the hype- or for that matter, the price. I do own Russian Red and yeah its a lot better than Ruby Woo. But so what? It’s not a patch on the comfort, shade or loveliness of Besame, Rockalily or Illamasqua. In fact in 6 months i think i have worn it three times, and i wear lippie every day. Actions do speak louder than words so i shall shut up – and go and reapply my illamasqua Sangers 🙂 Do keep up the reviews please, you do a wonderful job. I love this lipstick but then I love the matte look, and the fact it lasts so long. I have to agree thoough on the packaging front: it looks professional and neat but so so boring. 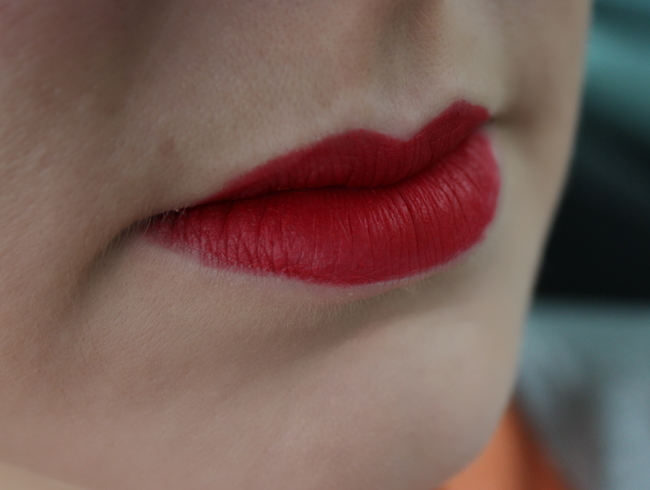 Do you know, I always thought MAC were THE brand for lipsticks, and I’ve been using Russian Red for years without really thinking about it – then I see other ladies whose red lippy hasn’t gone into clumps or wiped off from the inside of their lips outwards, and I wondered what I was doing wrong – obviously all I need to do is try a different brand! After reading the rest of your reviews, I promptly ordered Rockalily’s Roulette Red, and now I can’t wait for it to arrive! I would love bold red lips without the dryness. Yup, as a make up artist that works in the cosmetic industry I don’t rate mac lippy’s! Believe it or not I love Bobbi Brown old hollywood. Nice semi-matte that lasts without too much drying. But I’m dying to try rockalily! This is one of my favourite lipsticks, but I think it depends very much on the texture of your lips and I don’t tend to wear it everyday. As an everyday lipstick I prefer Mac Red, which is satin, but for a real wow nothing does quite the job of Ruby Woo. I always put on balm beforehand though, and that tends to be enough to keep it from drying out. You should review Pout Paint from Superdrug, I saw a review on another site a gave it a go and i really like it, you only need a very small amount and the colour is really strong they do a good pink too but all the other colours are a too modern for those of us looking to create a classic look. I agree. I know others love Mac lippys but they dry my lips out for days. I, like Kitty, live in Australia and have had a big issue with paying so much money for a lipstick that now sits in my make-up box, glaring at me everytime I open the darn thing! I’m yet to find a great, wearable, matte red and have just had to learn to embrace shinier reds. Still don’t have any of the MACs. The dryness would annoy me, I think. One for short trips out I think. It is a lovely colour, it looked a little more orange on me when I tried it in the shop.